Two weeks ago I got Tilly’s Love at First Stitch in the mail and on the same evening read it from cover to cover. Although I love Tilly’s blog, I had my doubts about buying the book. I have so many sewing books that cover all the basics and as I consider myself an advanced seamstress by now, I thought this book just wasn’t for me. However I saw all these gorgeous Megans, Lilous and Mimis popping up over the interwebs and wanted to get a hand on these patterns myself. Even if I don’t like the book, I thought, it would make a perfect prezzie for a novice sewer. All I can say is I wasn’t disappointed. Quite the opposite! Although the book covers all the basics more advanced sewers will already be familiar with, it’s super entertaining to read. I love Tilly’s voice in there and you will find her distinctive style on every single page in the book. I even found out that my cheapo-machine has a thread cutter, which I had never noticed before. Win! The book itself is absolutely adorable and I won’t be giving it to anyone. I will keep it. Forever. HA! But I might get a second copy in the future, should I ever need a sewing-related gift. Since I was eyeballing the Megan dress from the beginning, this was the obvious first choice. I traced the pattern before even knowing what fabric I would use. I found two fabrics in my stash which were leftovers from previous projects. Basically the same fabric in different colours. I don’t quite know what fabric it is though. It’s quite heavy-weight, but stretchy and seems to be a woven. It’s probably a blend which definitely contains polyester. Any ideas? I used the navy fabric for my Audrey Hepburn dress and the green fabric was leftover from my wiggle dress. Stash diet ahoy! The dress was stitched together in just a few hours, with no alterations. I cut out a size 3, which according to the measurement table should’ve been rather wide, but it ended up being a bit too tight, although the fabric is quite stretchy. There’s a bit of gappage at the back when I lift my arms, so I have to keep reminding myself to pull the dress down every once in a while. 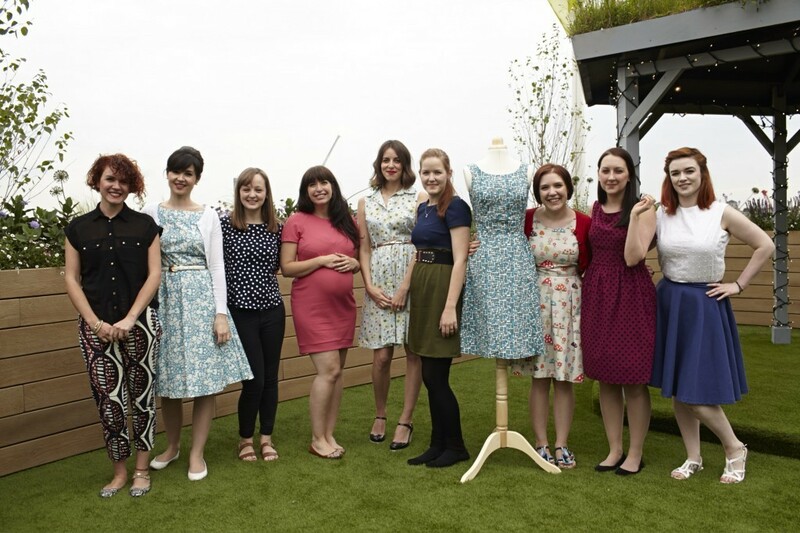 I started the dress the night before the John Lewis Sewing Bee and still had to put in the zip in the morning. But I managed to finish it on time and wore it that day. I actually wore it twice already, on a hot sunny day last weekend but I noticed that it’s a bit too warm for those incredibly warm days outside. I will probably sew it again using some light-weight cotton. Are you planning on getting Tilly’s book or have you already tried some of the patterns? I am a beginner and know already a little bit, but far not enough! I would love to sew a dress. Would you really recommend the book to a beginner? Is it with tutorials? It’s a great book for beginners, probably the best! It’s written with someone in mind who’s never touched a sewing machine before. It will guide you through all the steps like threading your machine, sewing your first seams etc. with pictures and very detailed instructions. Each chapter builds around a different project. The projects get more and more complicated and if you follow the book through, you’ll sew your own dresses and blouses in the end! All projects come with step-by-step tutorials. The explanations are completely sewing-jargon free and therefore easy to understand for a beginner. 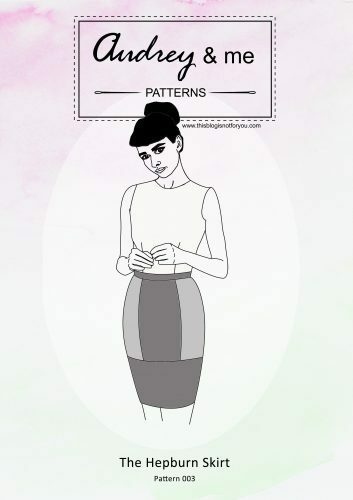 The book includes paper sewing patterns for all the projects, which you can trace or cut out. 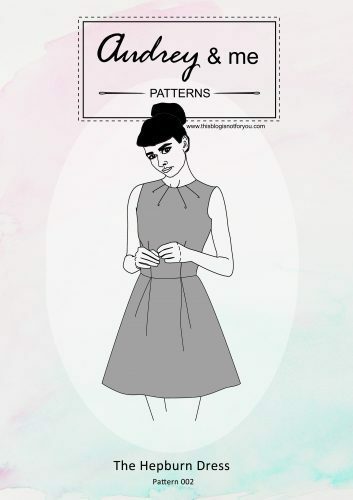 I would absolutely recommend this for you if you want to learn how to make clothing/dresses! Great colors on you and the dress is really cute. 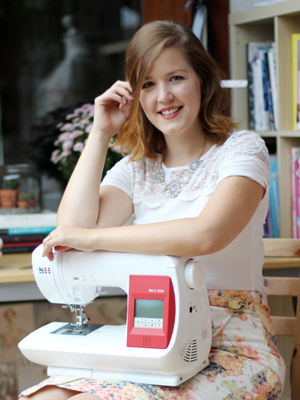 Just wondering if you have a hem stitch on your sewing machine? My eye went right to the hem line because of the definite line that the straight stitching on the hem makes. Just a thought that if you use a hem stitch it would hide that. I’ve never heard of a hem stitch, so I guess it doesn’t ? I will look into it, sounds interesting! Thanks for the tip! I think Jean means a blind hem stitch! This dress is fantastic, I love the colours you chose. The belt is perfect with it. I really enjoyed this book and the patterns are adorable, can only recommend it. Maybe you can borrow it from someone who already has it to have a look? Cute dress, great colour combo! 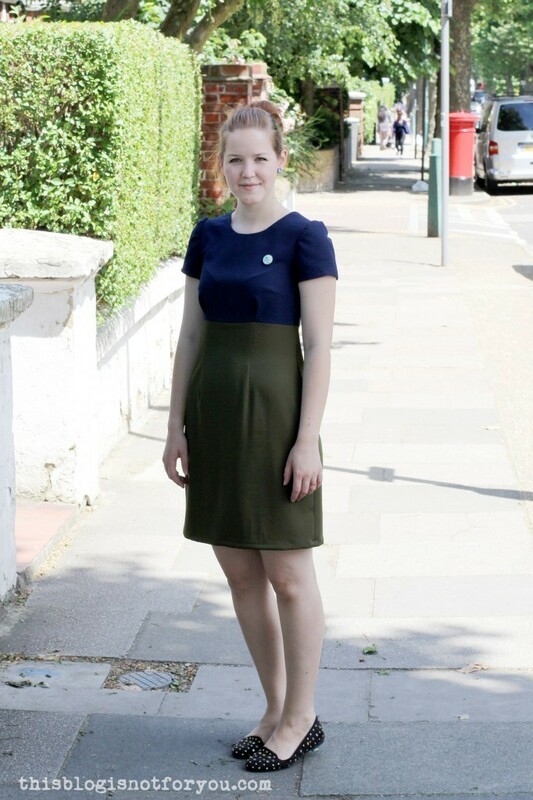 Quite possibly my most favourite colour combination there… olive and navy. And so flattering on your colouration 🙂 Love it! Lovely dress! I love Tilly’s book too – I’ve made a Clemence skirt already, and think the Lilou dress is next on my list – just need to pick a fabric now! looks amazing! I love your colour blocking. I’m not sure I’ll buy the book as it’s predominantly written for beginners but I do love the lilou pattern so I hope Tilly releases that separately! 🙂 your Megan dress is lovely. Looking forward to your other makes! I’ve yet to get my hands on this book (and still not sure I will be passed on the intended audience) but I’m tempted by some of the patterns. This is lovely, I love colour blocking!